Departement of the Hautes Alpes - Population : 100 inh. 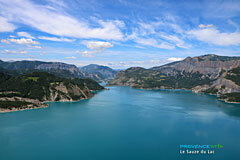 - Altitude : 1,049 m.
On the D954 along the banks of Serre-Ponçon Lake. 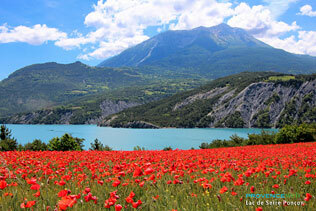 At the confluence of the Durance and Ubaye, the perched village of Sauze is famous for its viewing point offering a breathtaking panorama of Serre-Poncon lake. 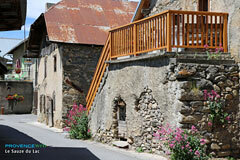 But Sauze has also remained a delicious country village, with its ancestral stable odours, between bales of hay, tractors and old rusted farming tools (enough to open a museum!!). When you stroll in the narrow streets of Sauze, between the sometimes dilapidated, lopsided farmer's houses, with their wooden balconies, time seems to have stopped, you are almost surprised to see a car here! You will come across at least one dog, a few hens and pheasants in the fields, and no doubt one or two old, ruddy complexioned, country people! Sauze is surrounded by vast green meadows and it has a more recently built neighbourhood, at the entrance to the village, with an amazing view of the lake. Don't forget to try the "Bar du belvedere", the best place to enjoy the evening sun setting over the lake, while literally drinking in the incomparably pure air. 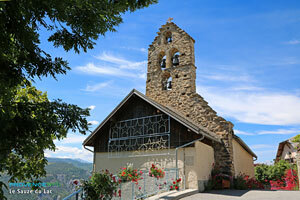 Notre-dame de la Colle church (12th century). The "Demoiselles coiffées" (earth pillars) listed site. 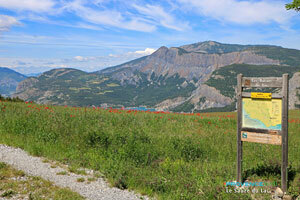 A wildlife park, La montagne aux marmottes (2 km away). Pêche, ski nautique, promenade en bateau... ou baignade sur la plage du Port St Pierre. Le Lauzet-Ubaye (14km),Pontis (8,5km), Savines Le Lac (11km).